Gold fell by more than $20 to a six-week low Friday, deepening a weekly loss to 2.0%. Other precious metals were hit harder on the day and week. The weakness did contribute to bargain hunting among United States Mint bullion products. U.S. gold coins, in particular, notched the highest weekly sales since mid-September. On Friday, gold prices for December delivery slipped $20.70, or 1.2%, to $1,724.00 an ounce on the Comex in New York. The settlement price was the lowest since September 6. Trading volume was the heaviest since Monday with intraday prices ranging from a low of $1,716.00 to a high of $1,744.70. "Gold remains defensive going into the weekend after a catalyst to drive the yellow metal above important resistance at $1,800/$1,802.89 failed to materialize," MarketWatch quoted Peter Grant, chief market analyst at USAGOLD. "Disappointing U.S. earnings are adding additional weight to equities, which is resulting in some deleveraging pressures," he said. "Such pressures tend to support the dollar, and at least initially, suppress gold." 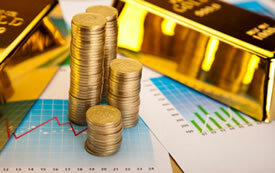 Market-watchers last week who were cautions about higher gold prices proved correct. Many analysts and bullion traders remain wary about prices next week, based on weekly gold surveys. "In the Kitco News Gold Survey, out of 33 participants, 24 responded this week. Of those 24 participants, six see prices up, while 13 see prices down, and five are neutral or see prices moving sideways," reported Kitco News. "Participants who see prices further decaying noted the change in trader attitude and a bearish short-term momentum for gold… Furthermore, those who are bearish on gold this week cite that October is seasonally the weakest month for metal…"
Bloomberg’s gold survey was a touch more bullish. Ten participants forecasted higher gold prices in the upcoming days while 9 were bearish and 7 neutral. Silver for December delivery plunged 77.1 cents, or 2.4%, to close at $32.097 an ounce. The white metal traded between $31.945 and $32.915. Silver’s 4.7% weekly loss was the biggest of the precious metals. Platinum for January delivery lost $28.20, or 1.7%, to $1,615.50 an ounce, ranging from $1,612.60 to $1,652.10. Platinum declined 2.6% this week. Sister metal palladium fell 2.5% on the week. Palladium for December plummeted $24.20, or 3.7%, to $623.00 an ounce, ranging from $620.50 to $646.25. For the year so far, gold has climbed 10.0%. It ranks behind silver and platinum which have each gained 15.0%. Palladium remains the sole precious metal lower in 2012 with its 5.1% loss. London precious metals weekly losses were 1.7% for gold, 4.3% for silver, 2.7% for platinum and 1.8% for palladium. Gold coins increased by 26,000 ounces against the prior week’s 11,500 ounces. The total was the best since 26,500 ounces sold during the week ended September 14. Splits were 24,000 ounces in 22-karat American Eagle gold coins and 2,000 ounces of 24-karat American Buffalo gold coins. Gold Eagle sales in October have already surpassed the totals from February, April, July and August. Silver coins rose by 632,500 ounces, above the very timid 177,500 ounces from last week. Splits were 608,500 ounces of American Silver Eagles and 24,000 ounces of America the Beautiful 5 Ounce Silver Bullion Coins. Boosted by the first week’s increase of 1,233,000, Silver Eagle sales in October have now surpassed sales in February and April. The following table provides the most recent daily, weekly, October and year-to-date bullion sales figures as provided by the U.S. Mint. In popular coin news this week, check out the coin designs for the 2013 5-Star Generals Commemorative Coins. Are prople that dumb ? Mint. Bullion doesn’t follow the market.